Finally — someone in a position to do something is calling Judge Rotenberg Center’s discipline-by-electric-shock methods torture. You may remember a couple of previous posts (here and here) about JRC’s electrically shocking children, many with special needs, in addition to aggressive use of restraints, withholding food and just general abuse and bullying labeled care. These are not exceptions or anomalies but the very approach the school is built upon. They are using pain and fear to alter children’s behavior and they are doing so openly — even as a selling point — and sadly, there is a public buying. Parents that would almost certainly never take a job in an office that shocks them to keep up production and compliance are packing their kids up and dropping them off for this. Some of these children have psychiatric diagnoses and behavioral issues, others developmental disabilities including autism. A top United Nations official has described as torture the shock treatments used by the Judge Rotenberg Center on some of its special needs students. Manfred Nowak, the Austrian lawyer who is the U.N.’s special rapporteur on torture, in May asked the federal government to investigate the use of electric shocks at the school in Canton. Earlier this year, the U.S. Justice Department opened an investigation into whether the center violates federal disability laws by disciplining and controlling students with electric shock therapy. “I have no doubts about it,” replied Nowak when asked if the practice is torture in an interview broadcast on ABC-TV’s “Nightline” this week. Nowak sought the investigation after reviewing a report critical of the center by Mental Disabilities Rights International, a human rights organization. Thanks in part to ABC’s Nightline who featured JRC story (which I missed), A wider public is aware of what’s happening under our noses — and worse, that it’s been happening for decades. Is that enough? I would hope that we are collectively disturbed enough by what’s going on to insist upon an end to it but the public doesn’t get too bent out of shape unless it’s their own pristinely “normal” children at the receiving end of the abuse. I would love to be wrong about that. There is no question. This is torture. This is an abuse of human rights. The fact that it is done in a school setting or under the pretense of “therapy” or to troubled and troubling kids is irrelevant if not even more damning and it shouldn’t take 39 years, the network news and the UN’s special rapporteur on torture to tell us that. You can contact Massachusetts governor, Deval Patrick HERE. Find out what he thinks, in the face of another election, of his governing over the only state in the nation to allow a facility like this to exist and thrive — and get the attention of the UN’s special rapporteur on torture. After all, people are shipping their kids up from other states with enough sense to ban such treatment. More importantly, tell him what you think of the torture of children and the disabled being carried out in Massachusetts. Demand change. I watched this on Beyond Meds, a great blog and the product of a very valuable mind. Go there, catch up on the archives and check back often. It is a video of a speaking engagement at TED by Temple Grandin on valuing the diversity of minds and the real-world usefulness of different types of thinkers. Grandin, diagnosed as autistic, has used her fixations and visual thinking in a great number of ways and her approach has lead to many children’s gifts being fostered instead of shrugged off as deviations. I had seen her on television years ago and not heard anything since. It appears she’s been quite busy. Thank you, Gianna for posting this. While I don’t think most would place me on the autism spectrum, I can relate to certain traits and perhaps more importantly to learning and thinking in a way that was not valued in my school years (for what it’s worth, I was labeled an ADD kid later into my schooling). There will always be a larger spectrum of human thought and experience and I will always wonder what things might have been like if there were a way for me to learn with my natural tendencies instead of in opposition to them. I am blessed to have found a career and a small group of peers that find value in the very traits that made me the subject of ridicule, separation and even physical restraint (another story for another time) in a broken school system. If there are to be labels for children and the way they think, let them be used to offer more and better options and a greater understanding of their gifts, not to measure their distance from an imaginary center held as the ideal approach to learning and socializing. As it stands, normalcy is defined by a child’s adherence to a broken, outdated and narrowly focused system and virtually everything short of that is a disorder at worst and disruptive at best. If we begin to change our views and our establishments to suit the endless resource of young minds, everyone wins. If we stifle them to suit an old educational and social framework, everyone loses — everyone. When I first heard that the Asperger’s syndrome diagnosis was going to be dissolved and absorbed into the autism spectrum disorders, my first thought was that people with the Asperger’s diagnosis were not going to be pleased. As it turns out, I was right. Aspies, a name many with the diagnosis have adopted, have an identity and a community wrapped up in the diagnosis around which many rally in mutual support — a diagnosis that’s been the source of some contention as its legitimacy has been debated and now its existence as a stand-alone disorder is in question. I’m not one for labels, in large part because they tend to be divisive but I firmly believe that we should be able to define ourselves as we see fit and the Aspie community has done just that — or at least they’re trying. In a time when thousands of people are trying to shake off one label or another, Aspies are clinging to theirs. Many diagnosed with Asperger’s fear that their collective identity will suffer a hit, even be lost entirely if they are to be lumped in with the Autism spectrum. Some parents say they’d welcome the change, thinking it would eliminate confusion over autism’s variations and perhaps lead to better educational services for affected kids. But opponents — mostly older teens and adults with Asperger’s — disagree. Liane Holliday Willey, a Michigan author and self-described Aspie whose daughter also has Asperger’s, fears Asperger’s kids will be stigmatized by the autism label — or will go undiagnosed and get no services at all. Grouping Aspies with people “who have language delays, need more self-care and have lower IQs, how in the world are we going to rise to what we can do?” Willey said. With any diagnosis comes assumptions preconceptions and often stigma. You are one of these, therefore I can expect this of you and these are your limitations. That’s the power of labels and that’s why some people are fighting so hard for some measure of control over the labels attached to them. While incorporating the Asperger’s diagnosis into the autism spectrum may have some benefits that are not currently available to those with an Asperger’s label, many disagree on how to amend the situation. Do we change the label or the distribution of services? And what, if anything, is a reasonable trade-off? Rebecca Rubinstein, 23, a graduate student from Massapequa, N.Y., says she “vehemently” opposes the proposal and will think of herself as someone with Asperger’s no matter what. Autism and Asperger’s “mean such different things,” she said. Both are classified as neurodevelopmental disorders. Autism has long been considered a disorder that can range from mild to severe. Asperger’s symptoms can vary, but the condition is generally thought of as a mild form and since 1994 has had a separate category in psychiatrists’ diagnostic manual. Both autism and Asperger’s involve poor social skills, repetitive behavior or interests, and problems communicating. But unlike classic autism, Asperger’s does not typically involve delays in mental development or speech. Aperger’s revolves heavily around social differences and many who embrace the label embrace those differences not as subnormal or abnormal but as very natural and normal leanings and behaviors viewed unfavorably “neurotypicals” (those outside of the autism/Asperger’s umbrella). While some connections may be made based on the many parallels between the two diagnoses, many Aspies fear the distinction in developmental abilities will be lost in the blur created by blending the labels. The change in diagnosis may prove to be a double edged sword in some ways. We tend to see developmental delays (as with autism) as being objective, legitimate and neurologically based while the traits of Asperger’s are primarily behavioral and lend themselves to a more hazy and subjective reading. For many, there is a struggle to link Asperger’s to autism as an established diagnosis while maintaining its distinction as not meaning limited or delayed developmentally. Still for others, especially parents seeking useful services and placement in schools, the question of perception has to be weighed against very real needs which currently hinge on the little numbered code that accompanies every diagnosis in the DSM. As I’ve said, I’m not one for labels applied by people other than the wearer and I’m inclined to think the whole situation might be better handled if we throw the book out altogether. If the DSM and it’s hairsplitting, mind measuring scales and labels didn’t exist, what choice would we have but to see people as individuals and not as representatives of their limitations — real or perceived? 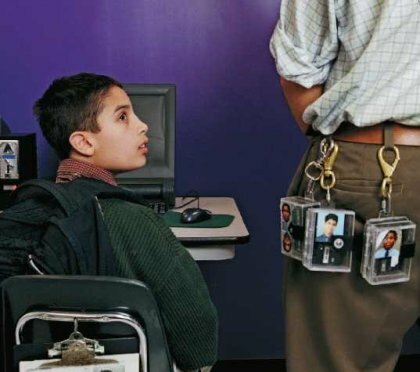 No one should need to take on a label to get the help they need, least of all children in schools and no one should need to cling to a diagnosis because a collective identity rests in it. Autistic people, Aspies, neurotypicals and beyond, we are who we are despite labels, not because of them. 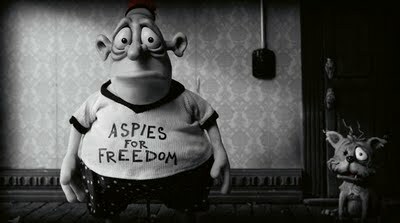 The image at the top is a still from Adam Elliot’s brilliant film, Mary and Max, featuring the voices of Philip Seymour Hoffman and Toni Collette. Go watch it. I don’t know if this coverage, questioning bordering on critical, is an anomaly or the beginning of the backlash but I hope it continues. It’s an unfortunate fact that television shapes the way millions think. Getting people to question whether human behavior needs a diagnosis can’t be a bad thing and it’s good to see the mainstream media casting even a shadow of doubt on the whole charade as it usually turns a blind eye in the name of its sponsors in pharma. Maybe the medical model has finally jumped the shark with the DSM-V.
Abilify, an atypical antipsychotic developed for adult schizophrenia, has recently been approved for irritability and self harm in children (aged 6-17) diagnosed with autism — an antipsychotic! These companies are out of control with their attempts to extend the range of approvals for their atypicals and Abilify seems to be leading the pack, chronologically, at least. It was also the first to get approved as an add-on for depression. Autism is a difficult thing to contend with — I know first hand — but to dose a kid up on schizophrenia drugs to control irritability is truly beyond comprehension. I’m sure there has been plenty of off-label use in just this capacity but one must wonder if the FDA even cares what they pass anymore. I’ve long given up wondering if there are any consciences at the tops of these companies. Add this to the pile of proof positive that atypicals are the new restraints. Consider the many uses for which these drugs are being granted approval and used off-label, and then think back. How many of these same “symptoms” were formerly handled with physical restraints of the most barbaric kind? They are actually being used even more generally and increasingly in younger kids with more mild behavioral problems. For those who think we should be grateful for less barbaric restraints, think again. We don’t need alternative abuses but true treatment. Putting the shackles or strait jackets or five-point restraints in a bottle is not the same as treating a disease or a disorder. It is no less barbaric or abusive under the guise of legitimate medicine. This isn’t a kinder, gentler approach anyway. Not when you see kids growing up with any number of very real ailments, like diabetes, cognitive dysfunction and tardive dyskenesia — and that’s just the ones that make it past the strokes. Oh and by the way, Bristol-Myers Squibb, makers of wonder drug Abilify, just closed on Monday with stocks at a record high for the year. Some people know a cash cow when they see it. I know that many parents are truly desperate for answers, options and alternatives in addressing autism and related behavioral issues and we should be finding them but drug companies cannot continue to be allowed to determine the standard of care. Antipsychotic use in children both on and off label is out of control and has been for some time and irritability in children with or without autism is not psychosis. After all this time, we still have a very narrow understanding of the mind and the brain is perhaps an even greater mystery. So how can we be so bold as to take something so intricate and foreign to us and try to fix it with the biggest hammer we can find? Some answers will not be found in a bottle, no matter how desperately they are sought and trading away health for desirable behavior –while great for investors and easiest for educators and often even parents — is always going to a bad choice for children. It’s not abuse if the kid’s really bad, right? Imagine living at a school, hundreds of miles from your family, with devices on your limbs and torso to administer electric shock — your teachers walking around with labeled triggers hanging from their belts, ready to administer “level III interventions” at the slightest infraction. And in case their watchful eye isn’t enough, they have the help of monitors to watch you on camera and report to staff when you break a “behavioral contract.” While this sounds like some sort of Orwellian worst-case scenario, it has been happening in one American school for decades. In some schools, “student” is just a nice, clean word for “inmate.” Perhaps that is most true at Canton, MA’s Judge Rotenberg Center, a school attended exclusively by those who are emotionally troubled or developmentally challenged (including those with autism and asperger’s syndrome) and exhibiting behavioral problems. Somehow I don’t think their methods, which include electric shock, restraint, seclusion and withholding of food, are the fast track to well adjusted kids. Just how painful those shocks are has been an area of particular debate. Technically, the lowest shock given by Rotenberg is roughly twice what pain researchers have said is tolerable for most humans, said James Eason, a professor of biomedical engineering at Washington and Lee University. The highest shock given by Rotenberg is three times the lowest amount. It’s not just the most offensive behaviors like violence and self harm that warrant shock at JRC. A child can be shocked for nagging, standing up without permission, swearing, sloppiness, raising his voice, speaking out of turn — any behavior outlined in an individual “behavioral contract” tailor made for each student — even if that behavior is a direct result of the child’s autism or other developmental disability. It is reported that some autistic children, seeing staff members reach toward their belts to shock other students, have screamed from fear that the shock was going to be for them. They were shocked for screaming. On tape, the staff recounted the reasons for different shocks, including swearing, verbal threats, and noncompliance. Of the two power levels of shock treatments used by the school, Dumas’s son received the most powerful each time, school officials have said. Shift supervisor Michael Thompson, on the job for two months, left the room at one point, saying he wanted to “either cry or throw up,” the report said. This, as seems to be the case with most things lately, is the tip of the iceberg so I’ll leave you with excerpts and links to more involved reports on Rotenberg by people who have visited. It is nothing short of abuse and it seems more true than ever that abuse can be tolerated by the public if you find a way to call it therapy. It is not therapy and cannot be said to “work” simply because it reduces the unwanted behaviors on a list. These children are likely to live their lives knowing only limitations, anxiety and fear of reprisal. I don’t know that any one institution is likely to produce a greater number of broken and fearful “students” than Rotenberg. •The Contingent Food Program and Specialized Food Program may impose unnecessary risks affecting the normal growth and development and overall nutritional/health status of students subjected to this aversive behavior intervention. •The collateral effects (e.g., increased fear, anxiety or aggression) on students resulting from JRC’s punishment model are not adequately assessed, monitored or addressed. Rotenberg staff place the more troubled (or troublesome) residents on 1:1 status, meaning that an aide monitors them everywhere they go. For extremely violent students, the ratio is 2:1. 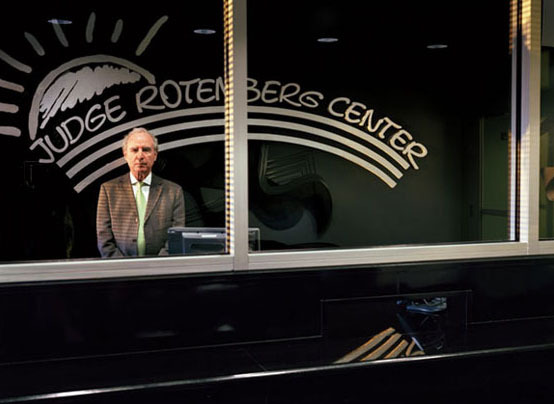 Soon after I arrived, right before I set off on my tour, a small crowd gathered—it seemed that almost the entire hierarchy of the Rotenberg Center was going to follow me around. That’s when I realized I’d been put on 5:1. Soon after that, Israel’s commune fell apart. As did a second he started in the South End…But he wasn’t ready to give up. He thought if he opened a school, he could provide the commune’s inhabitants with jobs. A self-sustaining economy might lead, ultimately, to utopia.